The Colt Single Action Army, adopted by the military in 1873, is without doubt one of the most iconic firearms in U.S. history. It has a long list of admirers. Production of the Colt SAA ceased in about 1940, but the gun did see some action in World War II and was carried at times by such notables as Gen. Jonathan M. Wainwright, Gen. Douglas MacArthur and Gen. George S. Patton—and for a time by a young Jeff Cooper in the Pacific. For his part, Gen. MacArthur racked up quite a score in action in Mexico before World War I. 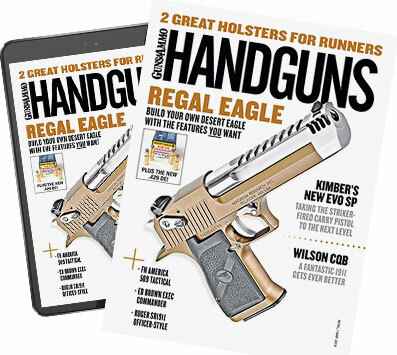 Upon his return from Korea, he was presented with another copy of his favorite handgun—the Single Action Army .45—by Colt but the details are lost to history. When SAA production ended, the machinery was stored in a corner of the Colt plant. Colt began making the SAA again in 1956, with serial numbers ending in SA. These guns are known as 2nd Generation, and I believe they are the best of the Single Action Army revolvers, an opinion that is shared by many. They were well made of good materials and were well fitted. Most of the 2nd Generation guns were 5.5- or 7.5-inch barrel lengths, with the 4.75-inch barrel coming along a little later. Finishes included blue, blue/case-hardened and nickel. 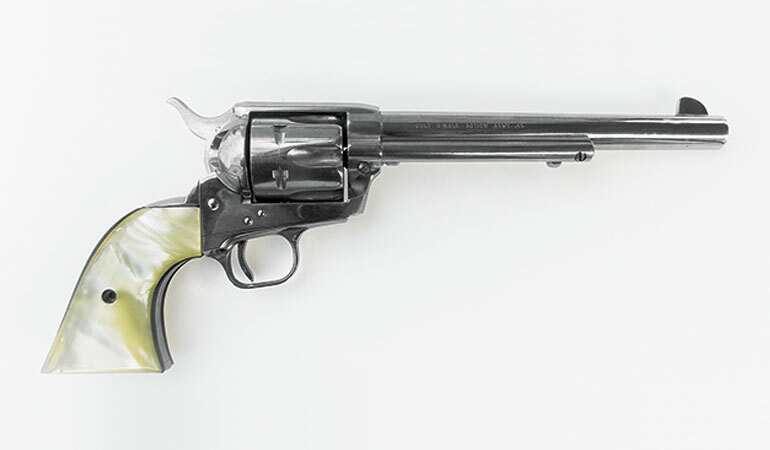 Special editions of the 2nd Generation guns included the three-inch Sheriff’s Model and the 12-inch Buntline Special. There was also a New Frontier version featuring a flattop frame and an adjustable rear sight, as well as a case-hardened frame and blued barrel. Only a few of the 36 calibers the Colt SAA was once offered in were continued. The 2nd Generation guns are chambered to .38 Special, .357 Magnum, .44 Special or .45 Colt. Very early SAAs feature the cone-style firing pin; the tapered type was a redesign introduced in the 2nd Generation. When one considers the millions of Smith & Wesson K-frame revolvers and 1911 pistols made, the numbers for the SAA are small. About 15,800 .357 Magnums and more than 34,000 .45s were made during the 2nd Generation years. The 2nd Generation era came to an end in 1975, at about the 74,000 serial number range. Colt said the original machinery was badly worn and “chattering.” The 3rd Generation guns are not bad guns, but in many ways, the Italian replicas are on a par with the Colts. Many years ago, while working as a security guard in college, I did lonely patrols in locales ranging from pulpwood plants to modern foundries. I had a Uberti SAA replica in .45 Colt I often carried, and I remember going to the gun shop and paying for 10 to 12 cartridges at a time. My first actual Colt SAA was a 2nd Generation .357 Magnum with a 4.75-inch barrel. However, the balance was all wrong, and it didn’t feel right in my hand, so I traded it. Today I finally have a first-class Colt SAA, also a 2nd Generation model. It is a relative rarity, with a 7.5-inch barrel and nickel plating, and it is chambered to .45 Colt. These days, original Colt revolvers command a premium, and I believe some of the resulting prices are ridiculous. Values range from around $3,000 for 100 percent guns to the $1,000 neighborhood for 60 percent guns. 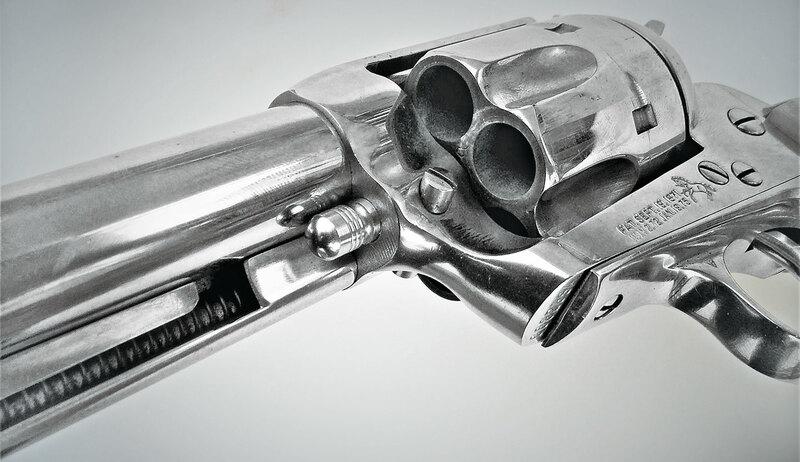 I think a collector-grade revolver should be unfired in the original box—or if worn or shot, it should be a revolver with an historic provenance. To me, the Colt SAA is a working gun, and though expensive, it is to be expected that it works well. My 2nd Generation gun is accurate by any standard. I know this because I shoot it. It’s reliable and accurate and hits hard. At 25 yards, it will put five of Black Hills Ammunition’s 250-grain Cowboy Action loads into less than 1.5 inches when I do my part. A requirement of the Single Action Army revolver on its adoption by the military was that it would hit an Indian war pony at 100 yards. This was not a daunting task. Almost every 2nd Generation revolver is properly regulated for standard ammunition, but if the piece fires a bit to the right or to the left, turning the barrel isn’t difficult. As for elevation, if you learn to use the front sight as it’s intended, holding one-third to one-half of the sight in the rear notch with the rest showing above, depending on the range and load, you will have a hit. The fit and finish on this 2nd Generation Colt Single Action Army are excellent and typical of the breed. Unlike 1st Generation guns, the 2nd Generations are a more affordable option for collectors—or anyone who wants to own and shoot a piece of American firearms history. I rely primarily on handloads for this revolver. Most of these are hard-cast 250-grain semi-wadcutter loads, using either Titegroup or WW231 to achieve 800 fps muzzle velocity. There are a couple of factory loads that I keep on hand. One is Buffalo Bore’s 255-grain semi-wadcutter at more than 1,000 fps. I sometimes carry this revolver in the field and would be comfortable hunting thin-skinned game with the Buffalo Bore load—or, if need be, using it for defense against animals. The sense of history and emotional attachment to this gun are unmatched. It may be my favorite Colt. If you are in search of a good-quality Single Action Army for the use it was intended, I recommend the 2nd Generation Colt SAA. It isn’t nearly as expensive as the collectible 1st Generation guns and will serve as well or better than any revolver.